I am an evolutionary biologist, and so am biased of course, but I think this field is the most exciting and intriguing field in Science (although quantum physics is a close call!) In these posts, I’ll explain why I study evolution, what evolution can tell us about the world, and how we might apply evolutionary theory to medical, agricultural and natural problems. Why I dropped out of psychology and became an evolutionary biologist, Part II: Evolution is happening, and it matters. At about the same time that I was getting very frustrated by my psychology courses, I was taking an Evolution lab course (taught by the ingenious Janis Antonovics) where the theories I had been reading about first began to take shape. It was my first taste of why evolution mattered to me and also of how I could test it experimentally – yes, with controls! 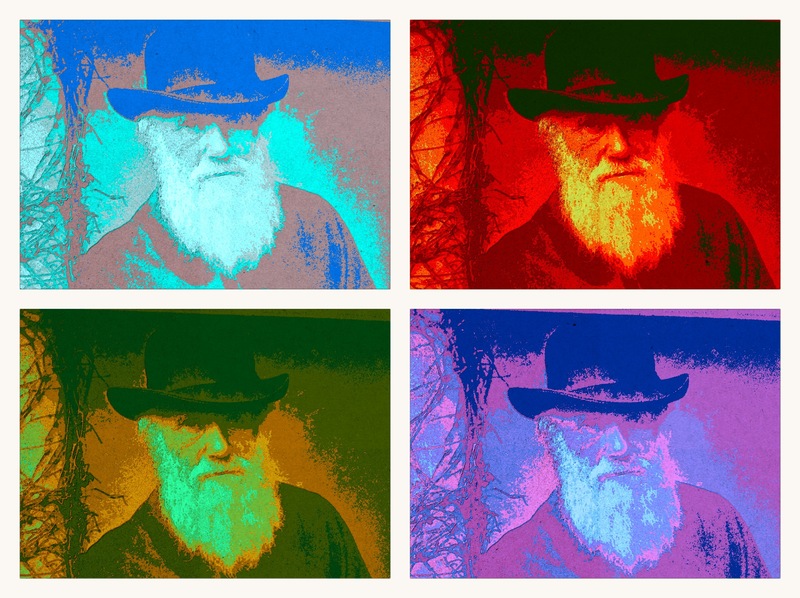 Happy birthday to Charles Darwin. I wonder if he could have imagined how useful his work would be? During one of our modules (or “labs” as I called them before becoming a Brit), Janis had each of us sample and test our own gut flora for antibiotic resistance. I won’t go into the details of how we did this (it is kind of gross), but instead explain why. When antibiotics are prescribed to kill off an infection caused by one pesky microbe, the entire microbial community is perturbed. What we are doing is imposing very strong selection against all sensitive bacteria in our body, and therefore selection for any bacteria that are able to survive. During treatment, replicating bacterial cells that do not carry resistance to the antibiotic you just took will be killed (want to know how?). This means you are left with much fewer, and a lower diversity of microbes; many of which positively influence your health. This was recently demonstrated using a multi-omic approach , where the researchers followed the microbial dynamics of a single patient taking antibiotics (for a nice synthesis of the work see here). They show that, as predicted, microbial diversity in the gut drops during the course of treatment and does not necessarily recover to its previous state after treatment. One common way bacteria survive antibiotic treatment is by halting reproduction. This works because many antibiotics affect only replicating cells, and therefore any cells in the population that are just hanging about in stationary phase, the so-called “persister cells,” are temporarily resistant. However, just to emphasize how little we know about one of the most important evolutionary phenomena affecting human health: bacteria break even this rule. A recent study out this month in Science  has found that a bacterium closely related to the one that causes tuberculosis is able to reproduce, albeit slowly, in the presence of an antiobiotic to which it is not “resistant” (according to the current definition). The ability of this bacterial population to persist in the face of antibiotics is because identically genetic cells are in fact diverse in their behavior; specifically in production of an enzyme with which the antibiotic interacts. This means that some cells, just by chance, are able to survive and reproduce but that their future generations of offspring are just as likely to be killed by the antibiotic as any other cell in the population. In other words, in the absence of heritable genetic change, the population is unable to respond to selection and will not evolve resistance (at least using this mechanism). Unfortunately, this also means that the population will be able to persist and, if it gets lucky, a mutation conferring heritable resistance will pop up. A similar result, albeit without the amazing microfluidics, was found in 1997 . If this result holds true for many more bacterial species, it would suggest yet another way in which our current army of antibiotics are likely to fail. So what does this mean in terms of finishing your course of antibiotics like all good children should? Well, we don’t know. We need data. I could rant about this, but instead I will refer you to a great talk by one of the experts, Andrew Read. Okay, so evolution happens every time you take your antibiotics. But what about those microbes that aren’t picking fights with their human hosts? Are natural bacterial populations evolving as rapidly? Of course they are! I recently monitored changes in bacterial and bacteriophage populations living within horse chestnut tress in a park near Oxford and found that the bacteria were rapidly evolving resistance against their local phages, and the phages were responding by overcoming this resistance – all within the course of a single season (Paper in review now, so stay tuned). There are also many many examples of bacteria that have evolved incredible adaptations to changing or hostile environments. For example, bacteria are now known to thrive under the Antarctic ice, in thermal vents reaching up to 235°F, and in heavy metal environments. The resilience and adaptability of bacteria is staggering, and we are now learning how bacterial evolution can work in our favor, for example by turning toxic compounds into pure gold, storing our data, protecting against the spread of dengue fever, or making our food. Rapid bacterial evolution also has major consequences for the fitness of macroscopic organisms with which they interact; our microbiota have important roles in our health (as I blogged about previously), plants associated with salt- and drought-tolerant Rhizobia can increase their fitness under harsh conditions, and emerging disease is often associated with bacterial acquisition of toxins or virulence genes. For example, the strain of Pseudomonas syringae that causes bleeding canker of horse chestnut trees acquired genes that allow it to thrive on woody tissue, presumably allowing for the host shift and subsequent spread. Much of the great evidence for rapid evolution comes from microbes because of their short generation times and large population sizes, but this certainly does not mean the patterns we observe are restricted to microscopic beings. Indeed, one need look no further than the size of our watermelons and dogs to realize the speed at which an eukaryotic population can response to selection – especially when it is imposed artificially. During my PhD research with Curt Lively, I was able to show that trematode parasites can impose strong selection on populations of their snail hosts over only a few generations in the lab. We evolved experimental snail populations in tanks with and without the sterilizing trematodes and found that, over the five year experiment, trematodes adapted to specifically infect the most common snail genotypes in the tanks and subsequently drove the frequency of these types down . And evidence for such rapid responses during experimental evolution is building. Rowan Barrett recently showed that stickleback populations can evolve cold-tolerance within three generations and Anurag Agrawal demonstrated rapid evolution (over only four years) of flowering time in experimental field populations that were affected by or protected from insect herbivores. So whether it’s microbes, plants, or animals, there is no question as to whether populations evolve in response to the environment they are in and the species with which they are interacting. Evolution happened, is happening, and will continue to happen. I study evolutionary processes because I believe an understanding of how populations respond to selection is the only way we will be able to produce enough food, fight disease, and protect natural populations. 3 Thompson, J. K., et al. “Mutations to antibiotic resistance occur during the stationary phase in Lactobacillus plantarum ATCC 8014.” Microbiology 143.6 (1997): 1941-1949. 4 Koskella, B. and C.M. Lively. 2009. Evidence for negative frequency-dependent selection during experimental coevolution of a freshwater snail and a sterilizing trematode. Evolution, 63(9): 2213-2221. Every few months or so, I go through a period of wondering why I am doing what I am doing (as a scientist, that is). It usually happens when I am talking to, or listening to a talk by, another scientist who is studying the mechanism underlying a specific feature of biology. For example, the exact mutations underlying a given disease, the specific cause of a newly emerging disease, or the cascade of interacting hormones that influences a plant’s response to the environment. In other words, when I hear other researchers who are trying to answer questions that have clear-cut answers. So why bother? Well, every researcher will have a different answer to this question. But for me, there are (at least) three very exciting reasons. First, because evolution is happening all around us, all the time – we just need to know how to look. Second, because of the new inroads being laid that allow us to understand how our and other genomes evolved millions of years earlier. And third, because experimental evolution allows us to explicitly test how evolution works and what its limits might be. Over the next few posts, I will highlight some of my favorite new work from each of these research avenues and (hopefully) explain why being an evolutionary biologist is not nearly as futile of a task as it might first appear. Okay, so what does any of this have to do with my decision to change degrees while I was at UVA? Well I thought I wanted to study human psychology; in particular, the role that biology plays in shaping our behavior (oh if my former self could have known that microbes play a role in this, she’d have been too excited to sleep!). I sat through some really great courses, and found the whole field incredibly fascinating. By my third year I had hypotheses… lots of them. I wanted answers. Unfortunately, every paper I read used statistics to attempt to account for confounding factors – like socioeconomic status or how much support a child received from their parents – and I found this very unsatisfying indeed. I wanted to test hypotheses directly. I needed control. Of course, I agree that it is unethical to randomly assign one twin to be raised in one way and another in a different way (or to teach a sick child to be terrified of rabbits), but how else can we satisfy our curiosity? And that is why I dropped out of psychology and became an evolutionary biologist. 1) Stanley Milgrim’s experiment where subjects give electric shocks to others despite their screams. 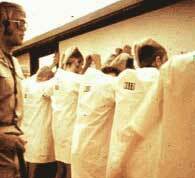 2) The Stanford prison experiment.